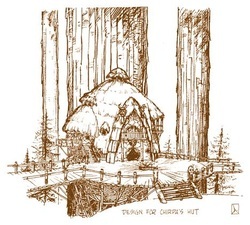 It's pretty rare to find concept art for Droids or Ewoks, but there are a few pieces that I have been able to spot around the web. This page features an archive of past Droids & Ewoks front page articles that highlighted some of that concept art. 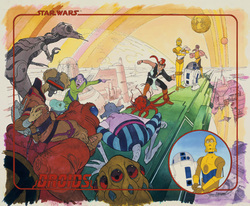 October 5, 2012 - Here we have a piece that was shown on starwars.com in 2010 during their coverage of the 25th anniversary of the Droids and Ewoks shows. In this picture we can see a pretty wild scene unfolding as a mob of aliens is about to attack the droids and their friends. The male human is obviously an early design for Thall Joben. 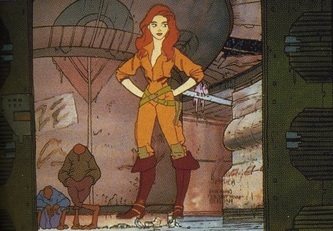 The girl could be Kea Moll, but it's hard to say, since she looks so much different that the final version of the character. Could she perhaps be the mother of the baby that C-3PO is holding? Who is that baby anyway? It looks like the characters are standing on top of a ship or some kind of space train that is flying above floating city. In the background we can see a ringed planet. There is so much going on in this scene. This has certainly got to be one of the most outstanding pieces of Droids concept art out there. October 8, 2012 - Here is another nice piece of Droids concept art that was seen on starwars.com in the Droids and Ewoks 25th anniversary article a few years ago. In this piece, we can see that Thall Joben's look has progressed from the art that was featured in an earlier post. He almost looks like the final character design. At this point, whether Thall Joben's speeder is supposed to be the Stingeror the White Witch, it still looks a lot different from the final version that was seen in the TV series and the books. From the looks of this picture, I'm guessing that Thall just finished carrying out an attack on the Fromm stronghold on Ingo. He looks like he just leaped back into the speeder as the Droids came zipping by, and is still holding a blaster that he was armed with while in the fortress. There was no scene like this in the TV series, but the artist has certainly given us a very nice look at an exciting concept scene. I wish I knew who the artist was so I could give credit here. Whoever it was, very nicely done! October 9, 2012 - The Star Wars Collectors Archive is without question your best source for finding images and information on vintage Star Wars products, this includes all merchandise connected to Ewoks and Droids. One of the cool finds at theswca.com is concept art for the Ewoks and Droids action figures. By the looks of things, these action figure concepts were made at a very early period in the development of Droids and Ewoks character design. Some characters, like Tig and Sise Fromm are nearly unrecognizable when compared to their final design. These action figure concept drawings are a real treasure for anyone interested in the development of the Droids and Ewoks television shows, as they give us a clear picture of the early design phase of many of the core characters from both series. Pictured here is just one example out of four that are posted at theswca.com. Please click on the picture to see more! 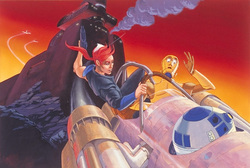 October 10, 2012 - Here we have another piece of Droids concept art related to the action figure line. 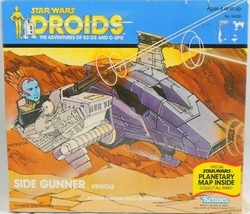 On this box for the Side Gunner vehicle, we can see what appears to be an early design for Tig Fromm. This character looks similar to the middle character in the picture from the previous post. Perhaps the Tig Fromm design was one of the last to be finalized before the TV series went into production? It's hard to say, but ultimately I think Lucasfilm and Nelvana made the right choice by changing up this design and going with the Tig design that they finally used. October 11, 2012 - Here's another beauty from The Star Wars Collectors Archive. 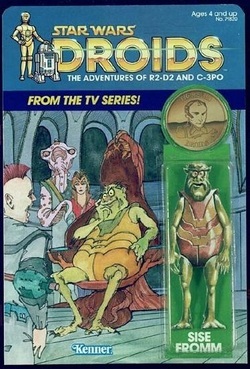 In the initial action figure packaging mock-ups, character concept art was used on the cards before a final design was approved. Some of the scenes on the cards have similarities to the final artwork, while others have no resemblance at all. For instance, the Thall Joben card depicts him in a scene very similar to the final approved art on the Jann Tosh card, but the C-3PO card features a painting of C-3PO, Ben Kenobi and Luke Skywalker on Tatooine. For more, click on the picture to head over to theswca.com. The Droids and Ewoks concepts are about 3/4 of the way down the page. 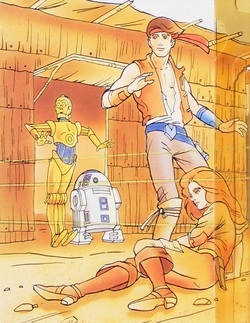 July 16, 2012 - Most Droids fans are familiar with Jessica Meade, the heroine of the Jann Tosh story arc. But did you know that Jessica almost ended up looking like a completely different girl? The picture to the left shows how we know Jessica from the cartoons, while the art below shows her original design. The first picture comes from the Jann Tosh Kenner figure card, while the second comes from an old issue of the Star Wars Insider.